In 1862 Charles T. Porter exhibited at the International Exhibition, London, an 8 x 24-inch engine running at what seemed then a fearful speed, 150 revolutions per minute. This was afterward set up in London and ran 225 revolutions. While I was there and saw this engine in the exhibition of 1862, my mind was occupied in other directions, and I paid very little attention to it. I did, however, see Mr. Porter, and copied for him the drawings of the Richards indicator on parchment for his patent attorney. I became acquainted with Mr. Porter later at the Paris Exposition of 1867, where he exhibited four high-speed engines and a model, all built by Whitworth, of Manchester. Two of the engines ran dynamos, the first I had ever seen; I do not remember whether direct connected or not; the other engines were, one a 12 x 24-inch, running 200 turns a minute, driving a part of the English machinery, and the other a 6 x 12-inch, running 750 revolutions idle, I believe. I think 400 revolutions were about its normal speed. The model of the engine, a complete 6 x 12-inch, was split directly through the cylinder, which was to me a wonderful thing. From what I know now I do not believe that any such pieces of workmanship as these engines were could have been made at that time in any engine shop in the United States, and I say this in the full consciousness of the fact that Corliss had a silver-plated engine in the exhibition at the same time. Corliss received a gold medal, a fact thoroughly well-advertised throughout the United States, as did also Mr. Porter and a halt dozen others, which was not so well known. 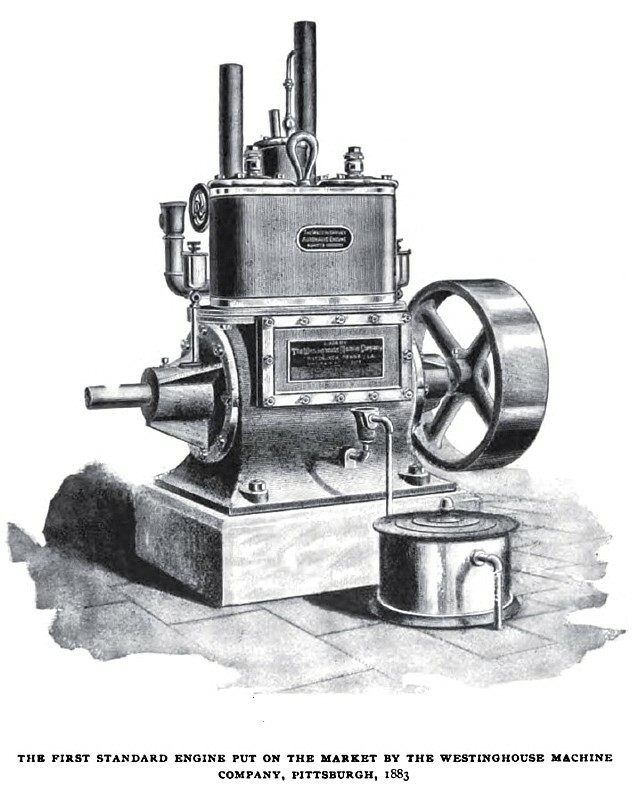 Mr. Porter's engines shown at Paris had the same bed as that designed by him in 1863, a design that has been copied more, except the Corliss, and lived longer unchanged than any other, and though it has been copied, imitated, changed, modified and counterfeited by others, it has never been improved upon. Tangye Brothers, of Birmingham, England, adopted a modified form of it years afterward. I do not remember just when it was, but think it was at this time, that Mr. Porter explained to me his conception of a marine governor, which, as I now remember was simply forestalling what we are using, a spring to resist the centrifugal force of the governor balls, instead of depending on gravity, as had always been done before.. This resisting the centrifugal force of the governor ball by a spring instead of gravity means a good deal more than at first sight would appear. Centrifugal force increases directly as the radius of rotation, and a spring’s resistance increases in direct ratio also, which makes it easy to establish a delicate state of equilibrium in all positions of the governor ball; whereas with gravity, which remains constant, the pendulum arms have but one position when they are just right, and give a very small range of good results. Mr. Porter did more; he introduced refined workmanship in engine building in the United States,—the first. I believe, to make mechanically fitted valves on flat planes; introduced the better indicator, and did, besides, a great amount of scientific work, original and valuable to all who have made the nature of heat engines a study; and, in passing, I may say one thing more,—no man, unless it was Zera Colburn, has, to my mind, ever been able to write on mechanical subjects and make his thoughts so clear and use such admirable language as Charles T. Porter. Along in the early seventies the business of the Porter-Allen Engine Company was started in Harlem, and met with disaster, owing to a combination of adverse circumstances. The engine was later built by Hewes & Phillips Company of Newark, and since by the Southwark Foundry& Machine Co. It is likely that the Porter-Allen has had as few changes in its mechanism since its first completed form as any, with the possible exception of the Buckeye engine. Corliss, it will be remembered, modified his design just before he died, and it then had what seems to us now a long life without change; but I doubt if as long as the Porter-Allen, now nearly forty years. 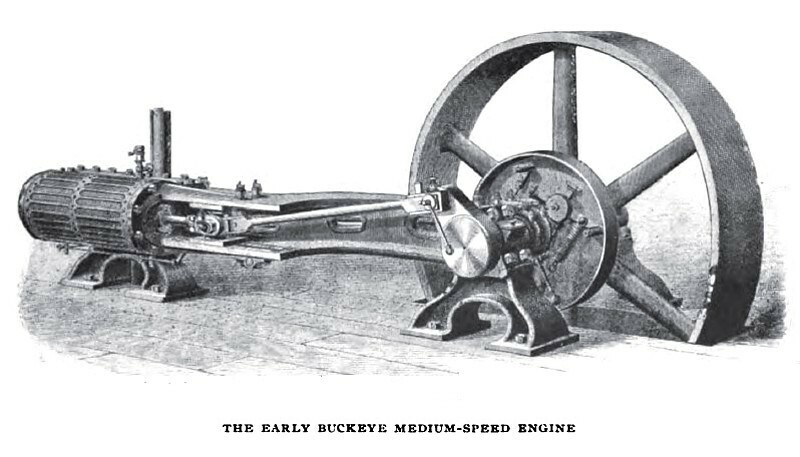 No automatics were built here until the formation of the Buckeye Engine Company, but very high-speed engines had their drawbacks. I have frequently seen worn-out crank pins, the worn-out part on the inner side so nearly central with the crank line as to show that about nine-tenths of the wearing strain was due to the momentum of the reciprocating parts. On the outer side of the pin a strip of the original shop finish generally remained visible after one-eighth or more had been worn off the inner or shaft-ward side. Yet every device was used to lighten the parts, even to making basswood pit-men surrounded with light straps; but when the saws were not kept in best order the stress often greatly exceeded the factor of safety. The wooden pit-men were soon abandoned with the advent of the circular saw, but nothing but wooden pit-men was ever used here to connect the saw to its crank." The large engine was, as it is now, a shaft-governed engine, and, so far as I can recollect, practically like their present standard machine, but was not high speed. 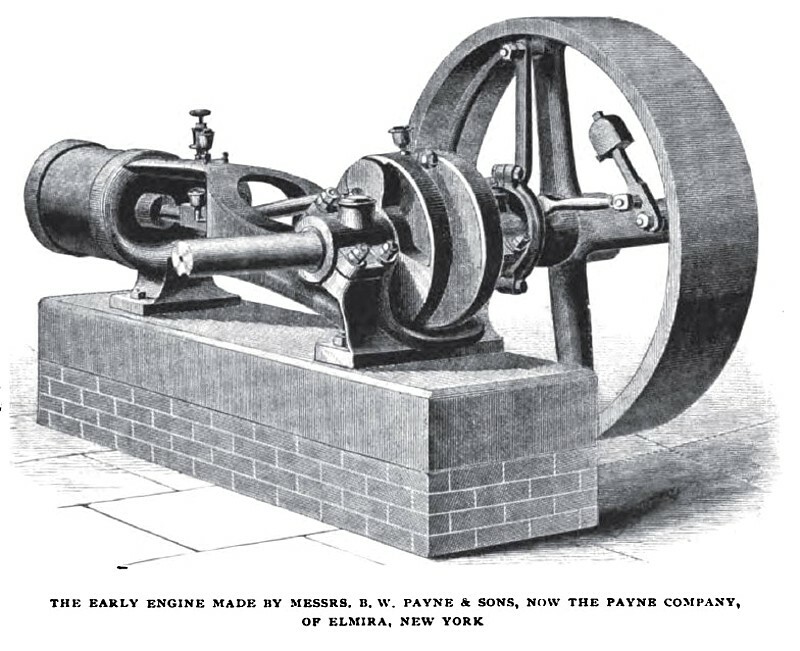 Some years before the Centennial, Messrs. B. W. Payne & Sons, of Elmira, New York, were, I heard, building shaft-governed engines, as were also Hall & Whitmore, of Havana, N. Y., but not particularly high speed, as I remember them. The first Straight Line engine was built in 1872, purely to try a lot of experiments. I was well aware of the fact that, in general, it is not good practice to try two experiments at one time; but this was a different thing. To tell whether a long piston was better than a short one did not interfere with trying to find out whether a solid box was the thing for an engine main bearing, and these were the sort of experiments that were coupled together. It is doubtful if ever more departures were made in any standard machine than were in that conglomeration of mechanism,— casting the frame with the cylinder; making the frames straight and resting the whole on three points, with one unfastened; casting the jacket on the cylinder, with solid cast-iron boxes and ring oilers; putting the fly-wheels on the throws of the centre crank and building the whole up, which was then new, and thus putting the fly-wheels between the frames; using a long piston, one equal to the diameter of cylinder, secured to the rod in a new way (fastening the end in the cross-head by a half nut); a cross-head so long and guides so short that the two were of the same length; a cross-head pin tight in the connecting-rod and with two bearings in the cross-head; connecting-rod of steel casting, half of the box cast on, oiled through the crank-pin and a different method of oiling the guides. A single valve of the Porter-Allen type performed all the functions of a slide or piston valve. All the pivots, except the crank taper joints, had take-ups endwise. There was a novel governor of the fly-ball pattern, in which the ball traveled in an elliptical curve, which closely conformed to the parabola which had been determined to be the true form. In the old days there was about as much high science spread over the flyball governor as there has been in recent years over the shaft governor, and it came to an end about 1880 on the Cosine governor, about which there was a great ado. This Cosine governor was nothing more than the governor on the first Straight Line engine, scientifically developed rather than being made by hand. The governor controlled a sliding block in a link and varied the cut-off. The engine ran, off and on, for a number of years, and in a dozen different places as a helper in emergencies, ending up as the central figure in the Straight Line Engine Works. The experiment proved a good many things; about as many things that would not work as would. The long piston was a miss and a go. When these pistons did not get to cutting, they went very well; but they were more likely to cut than the short ones, or at least that seemed to be the conclusion. The rods through round holes proved successful when we found out how to make the holes. The taper cross-head pin would not do, but the long cross-head and short guides were right. They were made straight, and never wore out of straight,—in fact, never wore much anyway, and this, with the many other experiments I have tried, has established the fact that things which do not tend to wear out of truth do not wear rapidly. The oiling of the cross-head was a failure; that of the crank was a success. The solid boxes were right in one respect and wrong in another, and led to a compromise that was better. The frame and wheels within the frame were right and the governor was all wrong. The valve, as then made, was wrong, but made so successful later as to be what it is known today. Between the time this experimental engine was built and the one built in the workshop of Cornell University and shown at Philadelphia in 1876 the shaft governor with shifting eccentric began to take shape. I had heard about it and had seen the Hall & Whitmore engine, but none with a shifting eccentric; but so built the engine shown at the Centennial, where I first saw the Hoadley portable, which also had a shifting eccentric and shaft governor, the Buckeye being, as was the Hall & Whitmore, a governor rotating the eccentric around the shaft controlling the cut-off only. It may be proper to remark that the Cornell engine was belted to the first Gramme dynamo ever built in the United States, which was also built at Cornell, the Gramme dynamo being the father of all direct-current dynamos, and the three elements, an engine, dynamo and electric lights combined, were the first shown in the United States at an exhibition, I believe. 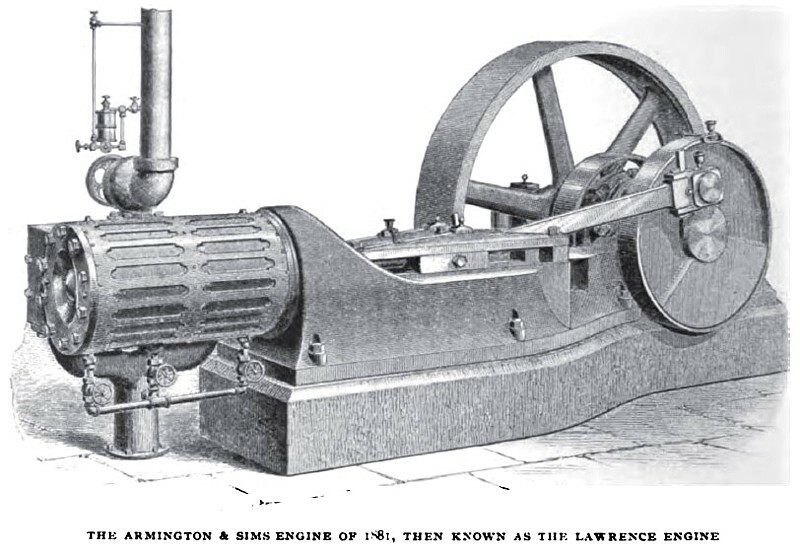 The governor of this engine shifted the eccentric by wedging it over by rotating a short piece of a primary eccentric in a way similar to the Armington & Sims plan, and it operated the dog leg rocker arm, which gave a constant lead at both ends of the cylinder. This was one of the many ingenious inventions that did not need to be made. At the time it was made it was supposed, and so stated, that with a shifting eccentric a constant lead could not be obtained, and that was the objection to the shifting eccentric. A good many designers have thought that the trouble was due to the fact that the eccentric moved on the arc of a circle instead of going in a straight line, but that has nothing to do with it. The distorted rocker arm corrected the lead; but, as said above, that was not wanted. Soon after going into the business we found that out, and the variable lead was adopted about 1882. 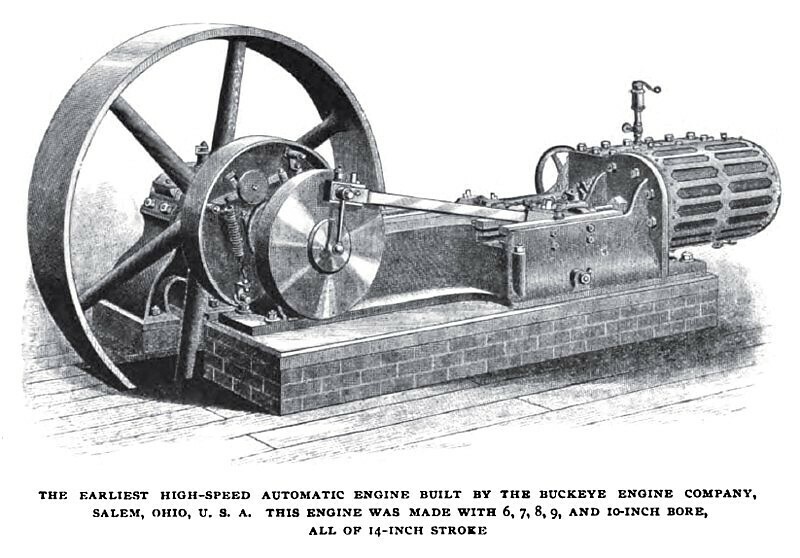 Until 1880, as I remember it, the Porter-Allen Engine Company were the only ones making a business of building high-speed engines, and they were neither centre-crank, single-valve, nor shaft-governed. The B. W. Payne Company had been building shaft-governed, centre-cranked and piston valve engines for a year or two, but nor exclusively, and somewhere about this time the Hall & Whitmore people went out of business; Mr. Hoadley had gone likewise. The three Straight Line engines built before and during 1879 were more or less experimental. In the autumn of that year building was started as a business in a small way. The first engine set to run a dynamo regularly was in 1881, and the incidents connected with it are appropriate to record, because while it is known that the electric light business helped to build up the engine business, is not generally known to what extent the high-speed engine helped the dynamo business. The electric light people were at this time building only arc-light machines, and they were having a good deal of trouble in the flicker and unsteadiness of their lights. The excuse was that the engines did not govern, and that if they could only get an engine that would govern, the lights would be all right. When this engine was set up at the Brush Works, at Cleveland, a 40-light dynamo was belted to it, with the full load thrown on and off, and Mr. Brush, after experimenting an hour or two, decided that the speed varied one-half turn a minute when the load was off and on, and there was not the least evidence of racing. This settled the question of an engine's governing, and disclosed the fact that the trouble, if any remained, was elsewhere. I mention this because this was before good governing had begun to be talked about, and there has been no change since, so far as the principle of its action is concerned. The governor designed by Mr. Porter to control the link-block on the Allen engine is still in use on the engine, largely in use in Europe in various styles of engines, and is used by some other builders, who designate it as a central weight governor, though it is a Porter invention, nevertheless. Just how perfect the Porter governor acts compared to the shaft governor, I do not know, but that it was a great stride over the old form of pendulum governors is unquestioned. It being belt-driven, however, it is probably less prompt on sudden changes than the shaft governor; but in remembering the slipping of the governor belts, we do not want to forget the sticking of governor pins. Having gone rather extendedly into the history of Mr. Porter's, the Buckeye and my own work, it is in order to follow Mr. Hoadley and Gardiner C. Sims, who were working together at the same time I was, but at first on a little different line. Mr. Hoadley's exhibits at the Centennial, where I first met him and Mr. Sims, as well as that of the Buckeye people, were portable engines, with the exception of a little one, not running, and which he called his Meerschaum, because of its resemblance to a pipe, and which he later designated the Chronometer, because it was made to run in all positions. His portables were centre-crank, shaft governed with shifting eccentric, single-valve engines. His governor was quite unlike our modern practice, having two double elliptic springs, practically like carriage springs, to resist the centrifugal force of the weights, and some peculiar lever arrangements which I cannot describe, Mr. Hoadley's original patents on the governor went back to 1872; though that as a shaft governor was antedated by various other shaft-governor patents, it carried a new form and was father to others that have appeared as original. In Mr. Hoadley's work Gardiner C. Sims was a co-worker, and just how much credit is due each one would no doubt have been hard for either of them to say. 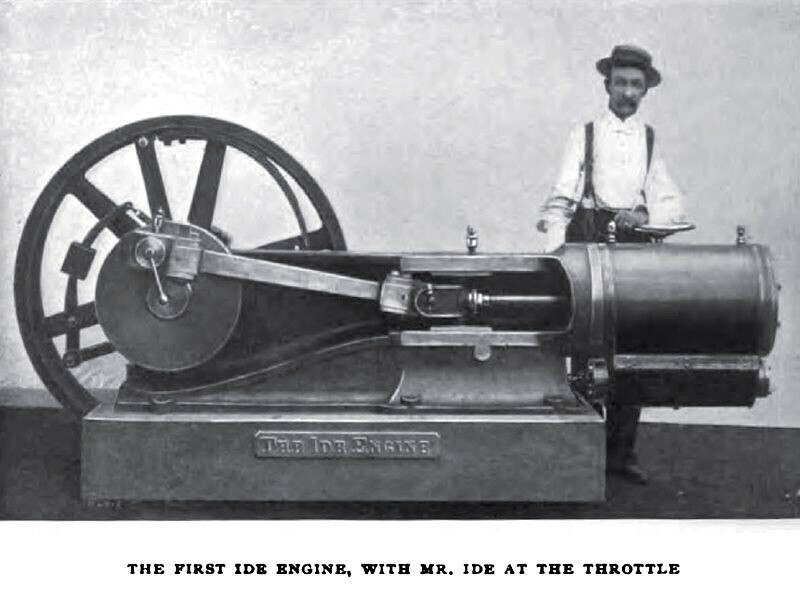 Of the early builders of shaft-governed engines in the United States, Mr. Hoadley's patent of 1873 probably is first, and I believe this engine, started on April 1, 1873, the very day I started my first engine, was the first shaft-governed engine ever run in America,—that is, as a business proposition. It is more than likely that other inventors may have experimented before, but it seems no one in the United States who continued in business anticipated Hoadley's and Sims' work. Their work, however, in the early days was not just what we are now considering,—that is, the centre-crank, shaft-governed, high-speed engine. The Cornell engine exhibited at the Centennial in 1876, built in 1875, seems to have been as early as any. B. W. Payne & Sons exhibited their first engine in the showroom of the American Electrical Company in New York in 1879, with the Tabor governor; Armington & Sims their first engine at the Paris Electrical Exhibition in 1881 direct connected to an Edison Jumbo dynamo, using the same governor up to the present time, I believe. The Westinghouse engine was first built for direct connection to a dynamo for a locomotive headlight; in 1882 three were built, with shaft governor outside, and in 1883 their first standard engine was put on the market. 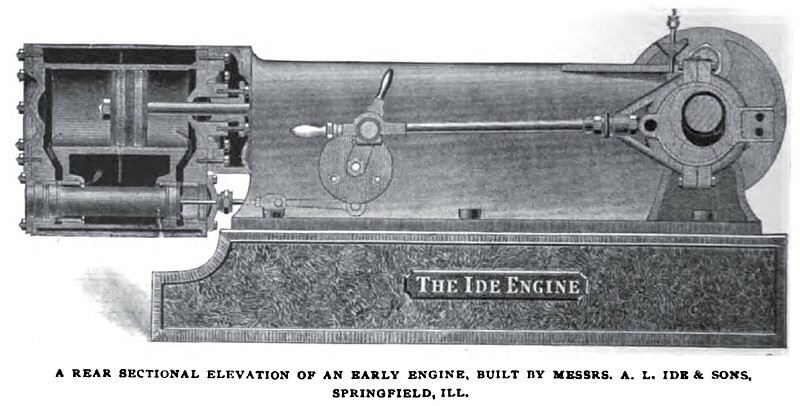 The first Ide engine was built in the latter part of 1882 and one exhibited at the Railway Exhibition in Chicago in May, 1883. This engine had a single ball governor, but when I advised Mr. Ide that I had a patent that covered this form he at once acknowledged the claim and abandoned that form for a time: but later, after using the two-ball governor, he found it worked just as well with one as two, and so simply left one of the balls off. The question whether he had or had not the right to do that was very nice, and might have been a rich one for the lawyers. 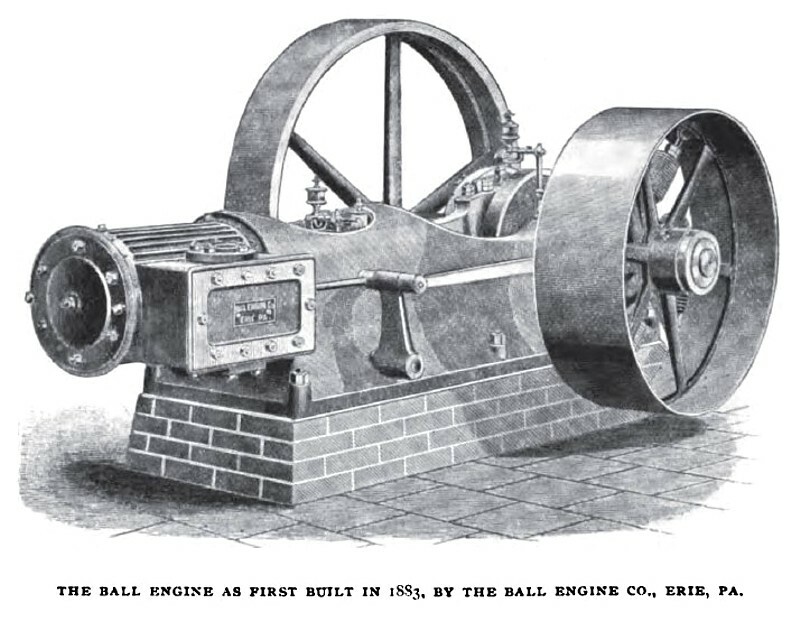 The Ball engine was brought out in 1883, and the first one shown at the Mechanics' Institute Fair in Boston in the fall of 1883. The Ball governor was not only a shaft governor, but was also fitted with a band-wheel loose on the shaft, which acted to turn on more steam as the load increased. This was abandoned later for another form, and still later for another. The governor which weighs the load and the inertia governor deal with a variation on steam pressure precisely as others, and as all meet all reasonable demands, then the most simple, reliable, durable and easiest of adjustment is to be preferred. Many concerns building similar engines have come into existence since 1883, and many gone out,—too many to schedule in this paper.